The capstone presentations represent the final milestone in completing the MSN degree. 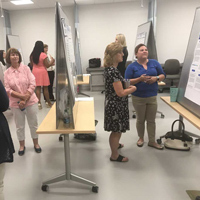 Fourteen graduate nursing students presented posters as part of their final capstone project on July 18. Students chose a topic and completed a literature review related to their focus of nurse educator or leader. The literature review was translated to a poster. Poster topics included: disaster preparedness, horizontal violence, and multi-disciplinary rounding. Webster's 38-year old Department of Nursing offers a Bachelor of Science in Nursing and a Master of Science in Nursing to registered nurses seeking to further their education and advance in their career. The nursing curricula focus on preparing today's nurses for the rapidly evolving health care industry and the increasingly vital role which nurses play in supporting and advocating for the health of our communities. Click here to read about specific program requirements, learning outcomes and how to apply.